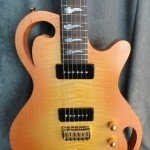 A semi-hollow body guitar with drop-shaped holes that extend through the entire guitar. This guitar has a flamed-maple top, myrtle body, and a fingerboard that is a laminate of flamed maple/quilted maple/purpleheart/quilted maple/flamed maple. 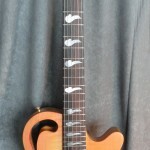 The inlays are a raindrop of abalone on the peghead, and stylized clouds (e.g. 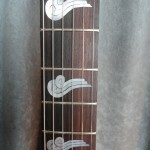 Tibetan clouds) made of Mother of Pearl on the fingerboard. The bridge is a gold strat-style string-through bridge with gold string ferrules on the back. 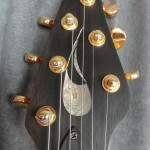 The tuners are gold Grover tuners with semi-circular knobs. 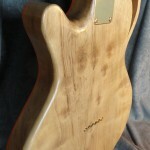 The pickups are handwound P90’s. 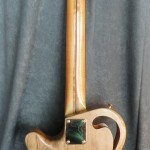 This guitar was finished in the Spring of 2009. Please click on thumbnail to view complete image.